SBI saving bank account holders can now get their account transferred to any branch by placing an online request. For this, you should have Net-banking facility activated for your KYC compliance account. SBI is the largest and most popular public sector bank in India. OnlineSBI which is the Internet Banking portal of SBI, is a convenient way to do banking from anywhere. By using online services, one can avoid the queue or delays which they have to face while going to the branch and get things done. Navigate to onlinesbi.com and login to the portal. 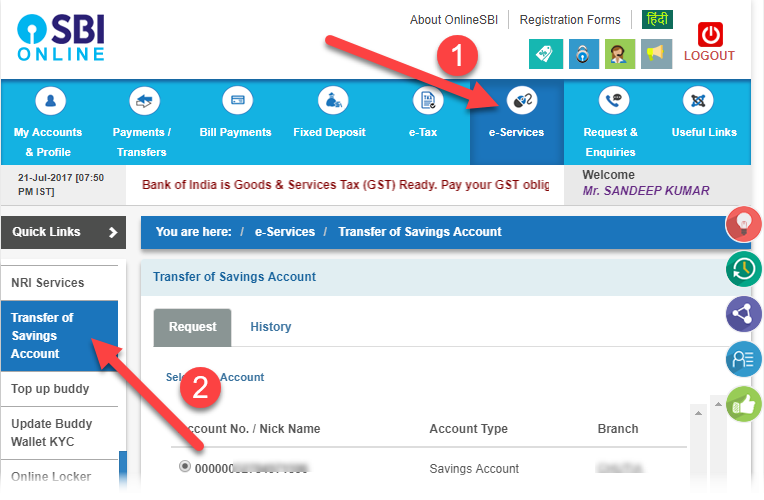 Go to e-Services tab and click on Transfer of Saving Account. In the next screen you can choose the account you want to transfer. In the Branch Code field, put the 5-digit branch code and click on Get Branch Name button on right of the input box. 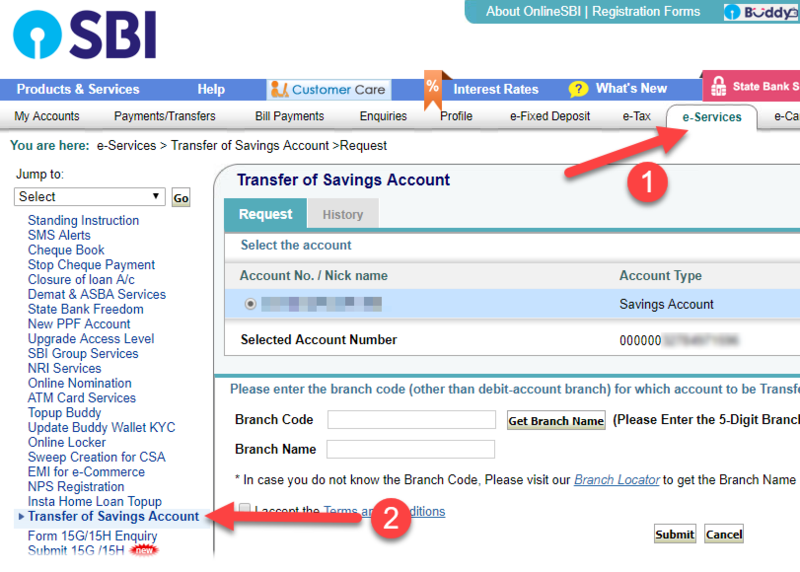 This is the new branch code where you wish to transfer your account. Branch code is last five digit of the IFSC code of any SBI branch. Let's say, if IFSC code is SBIN0012345, the branch code would be last five digit, here in this case it is 12345. If you don't know the IFSC code, you can use SBI Branch Locator form to get the details. Accept the term and conditions and click on submit button. After giving the OTP, its done from your side and the account would be transferred soon. This facility is available between 08:00 AM to 08:00 PM. Only Saving bank accounts can be transferred. Customer account must have KYC status verified before you place the transfer request. Inoperative accounts can not be transferred online. Transferee branch should not be part of Corporate Accounts Group (CAG) or Mid Corporate Group (MCG). If you are transferring all of your accounts (this is also applicable when you have single account), the CIF (Customer Information File) will also be transferred to the new location. In case of partial transfer, you can decide where you want to keep your CIF.